Augmented reality is a hot topic these days and I’ve been eager to explore its possibilities. Last month I attended a mixed reality meetup (Film 360 VR) at the offices of Meta in San Mateo. The evening provided fascinating insights into augmented reality via a panel discussion and hands-on demonstrations of Meta’s headsets. My only previous experience with mixed reality was (like so many other people) was through playing Pokémon during that fad last year. The Meta demonstration really opened my eyes to further possibilities but also made me realize the Pokémon had one thing correct: the best AR device is the one that you have with you. To that end, I set off to find that best method of publishing AR content through mobile devices. My search quickly brought me to the website of Vuforia, the leading platform for AR content. Vuforia has been around for several years but just this month has been added as an option install into the Unity development engine v2017.2. My timing seemed impeccable! I was able to get two of the teapots (the gold one and the purple one) to display on my desktop but the third refused to cooperate (perhaps because the ink toner is running low on my printer.) So basically… success! 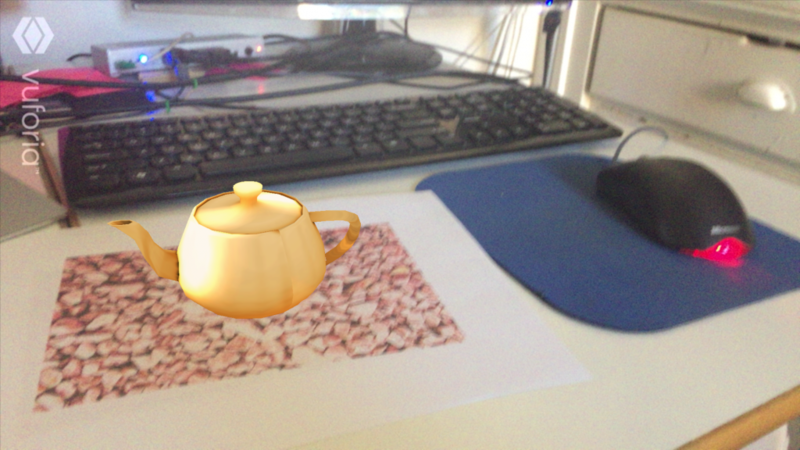 Within an hour I was able to create a working augmented reality app. Unfortunately, the tutorial was written in 2016 and the recent incorporation of Vuforia into Unity changed much of the UI related to Vuforia content. Nevertheless I was able to convert the instructions to the point where I could properly build the iPhone app in XCode. However, the animated 3D content (as well as the camera image) does not display when the app is run. Clearly, I have more work to do! In a follow-up blog, I’ll explain the changes I made to enable the animated content to play correctly on my iPhone.